At Alexander Gas & Plumbing Co ("AGPCo") we pride ourselves on providing comprehensive plumbing and gas knowledge across a broad range of applications. Our commitment to reliable service, including being available 24/7, coupled with competitive rates make your choice easy when looking for your plumbing or gas service provider. We are a family owned business that has generational knowledge for all plumbing and gas fitting problems. We are renowned for our reliability and integrity in carrying out all jobs to the highest standard. We offer only the finest of workmanship and we take the time to listen to your requirements and pride ourselves on providing quality solutions to your plumbing needs. We have a commitment to maintain high standards of Workplace Health & Safety and believe preventing accidents is achievable. We ensure our team are up to date with current Workplace Health & Safety practices and do our best to ensure that all sites are safe before proceeding with any work. 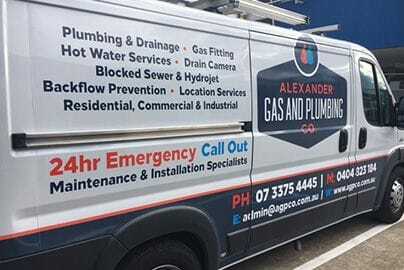 At Alexander Gas & Plumbing Co we provide a full range of plumbing services, drainage and gas fitting services to domestic, commercial, industrial and government customers across Brisbane and South East Queensland. We believe in delivering exceptional customer service. Our passion for our industry, attention to detail and business ideals allow us to stand a head above the rest. Our customers expect and deserve first class workmanship and we deliver this continually and consistently, providing service and competitive pricing to meet their exact needs. AGPCo is committed to providing second to none customer service and advice that is relevant to our customer's specific needs. Experience the difference and make your next plumbing or gas job a pleasant one.